I tend to be very ambitious for Halloween — thinking about Halloween that is…two months before it’s an actual reality. But because the holiday falls so close to Abby’s birthday, I end up having very little energy left in the inspiration bank once its time to dig out the hanging ghost for the front door. To look at my facebook feed and Pinterest page, however, this does not seem to be a problem for the rest of the world — or at least the virtual world that I travel in. So in order to not leave you completely in the (creepy, scary) dark, I thought I’d present a quick Halloween inspiration hit list (what to read, bake, dress up as, play on the iPod) based mostly on other people’s ambitious ideas. 1) One thing I know for sure I won’t have to do this year is scramble to find treat bags, because the personalized ones you see above, which I ordered for each of the girls on their first Halloweens, are still going strong. Crushing to think that they’ve been around for nine and ten years respectively. 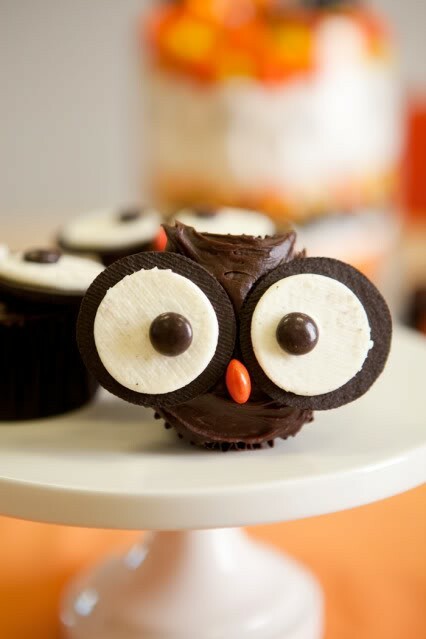 2) I found these Owl Cupcakes via Pinterest, traced it back to a site called Kara’s Party Ideas, but couldn’t find the specific post itself. No matter, the reason I love it so much is because looks like the baking-challenged among us (me) would figure it out without written instructions. Looks like all you need is your favorite cupcake mix, chocolate icing, M&Ms and Oreos. 3) How funny is this Awkward School Photo costume? (Via Cup of Jo.) My kids are going as Medusa (any leads on a snake headdress that doesn’t cost $35 are welcome) and a Detective (badge, hat, magnifying glass, my old trench coat, done). I really love seeing creative kids’ costumes, so please send them my way or share them on the DALS facebook page. You never know, I might be in my random-prize-awarding mood when I see something I go crazy for. 4) Costume ideas for Siblings (photo credit: imgur) I can’t imagine my two hyper individualistic little monsters agreeing on a theme costume idea (they each eat different salsas, for crying out loud), but you might have better luck. 5) A Zombie playlist to blare from behind the bushes. One thing I DO get around to is downloading creepy sounds from iTunes (you can literally search — and find — anything: creaky door, howling wind, witch’s cackle, creepy scream). I play them on repeat from an old CD player strategically planted near my front door. 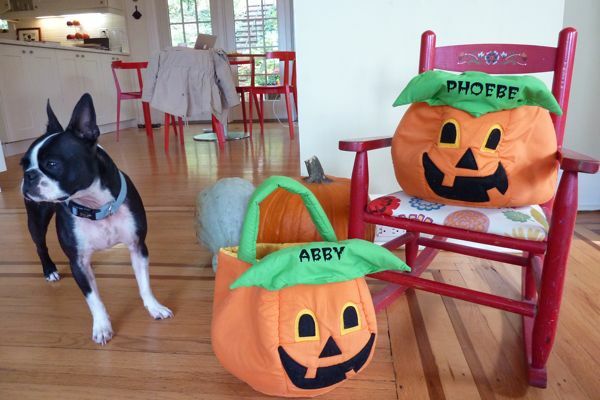 6) Naturally, it would feel wrong to have a post about Halloween that didn’t include Martha. 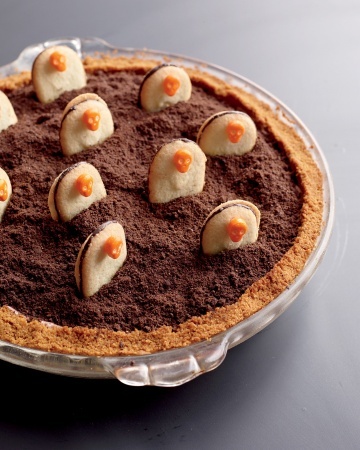 I like the Milano tombstone part on this Graveyard Pie the most. You can probably steal that idea on any pie or chocolate cake or a cupcake you’re making for the School Halloween Fair. 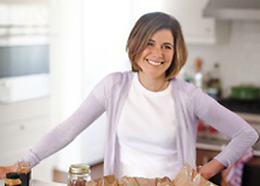 7) Inchmark’s Brooke is back from an excruciatingly long maternity leave! (Well, excruciatingly long for me at least.) She hasn’t logged any Halloween posts for this year yet, but a quick search unveiled some gems: A cool tip for lighting jack-o-lanterns, potted pumpkin pies, a seemingly easy Luke Skywalker costume. 8 Sara’s Eyeball Cupcakes, from last Halloween, of course. I’ve used this red velvet cake recipe for the rest of year, too and it’s a winner. 10) For ambitious carvers in the New York area, it’s absolutely mandatory to take a field trip to the Great Pumpkin Blaze in Croton-on-Hudson, NY. 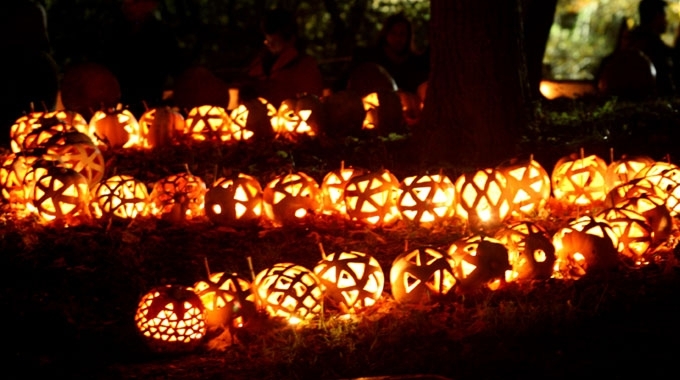 Five thousand individually carved illuminated pumpkins. That’s all I need to say on that one, I think. 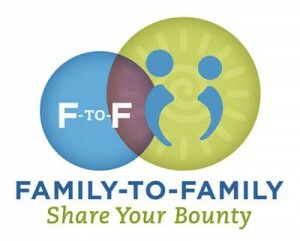 Oh, except one more thing: tickets go fast, so act sooner rather than later. 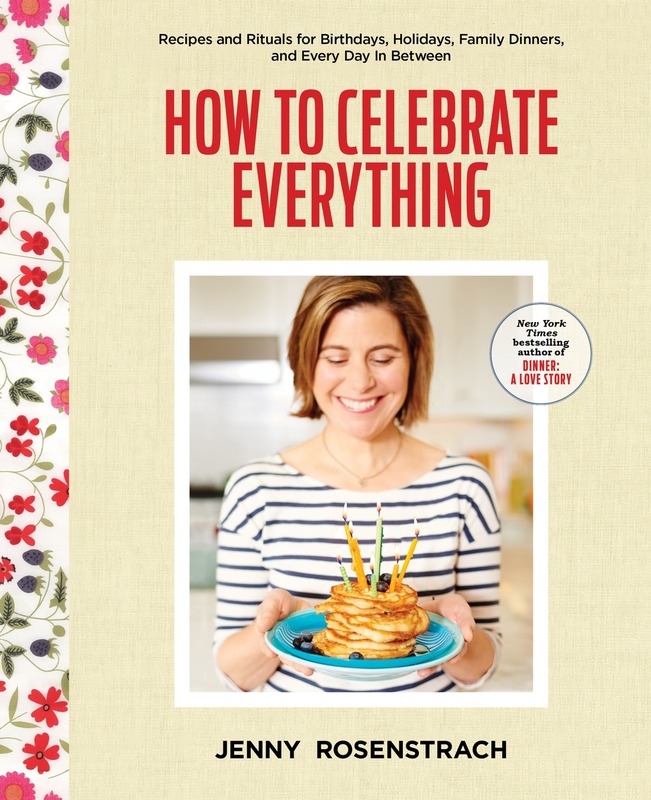 Please head over to Dinner: A Love Story’s facebook page to share your own photos and ideas. Or do it right here in this post. I’m sure the DALS community would appreciate it. I certainly will. Take old ties and stuff with batting and a wire coat hanger to make snakes. Then you should be able to attach to a headband, I imagine. 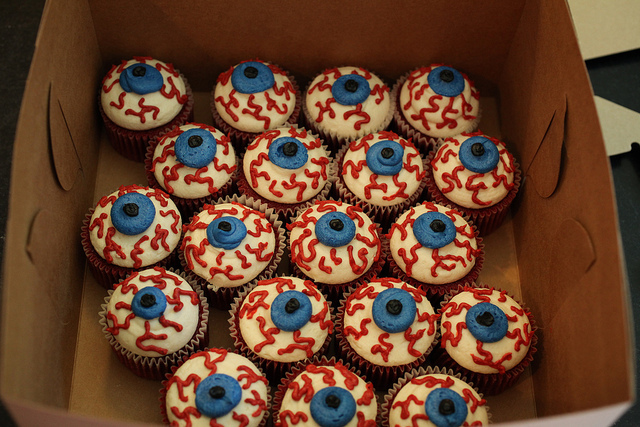 Love the eyeball cupcakes! My kids are 9-14, and they are all about the gross stuff at Halloween … body parts are a favourite!! Thanks! I went as Medusa a couple of years ago and I just teased my hair into a mess, hair sprayed it into place, and wove in several plastic snakes – I got the idea from Martha (where else?). I don’t think I have any photos to send your way – sorry, but I’ll e-mail a photo of my toddler as an In-N-Out milkshake. I, too, am an ambitious Halloween planner. I had creepy porch decorations pinned and planned on making costumes for my two boys (they were going to be a viking and a dragon). My baby girl was born on October 3rd, so I’m now okay with the three pumpkins on the porch,the spiderwebs we’ll put up later, and the pirate costumes I bought from Amazon. Hopefully I’ll get around to making a spooky dessert. For my Medusa costume I bought a bag of plastic snakes from the dollar store and tied them into my hair. Two bags and more than five minutes on the process would have improved the look. I just thought of a duo costume. Phoebe can be Medusa, and Abby can be someone she turned to STONE. Done! Julie: hilarious. If it were a tweet I’d “favorite” it. And if P could use that power on A she would. I remember making a Medusa costume for “Greek mythology day” in 6th grade. We stapled rubber snakes from the dollar store onto a crazy frizzy wig and then covered it with spray glitter. I wish I still had it! If only my son loved Halloween as much as he loved Greek mythology! I can totally see him as Perseus holding Medusa’s severed head! On the sibling costume themes note – I always thought it would be fun to have my son and daughter go as Christopher Robin and Winne-the-Pooh. This would have been the perfect year for it, too, because my son is 6 and kind of looks like Christopher Robin and my daughter is 4 and would make an adorable honey-colored bear. Of course, since my son IS a 6yo he is totally over WTP and is all set with his superhero costume. So I guess I missed the boat on that one! graveyard pieeeeeeeeee! i think i’m going to have to make this – as in, buy a pie and stick the milanos in there. haa. i don’t have kids yet (due in feb) but i think my man would appreciate it just as much. love! Jenny, I borrowed your book from the library. I can’t put it down. It has totally transformed my cooking. I’ve made three recipes so far, chicken pot pie tonight- and it’s delish! My family thinks there might be movie deal in this. I’m a big fan. Anytime you want to visit Fort Worth, you must eat at our house. You are awesome!!!! My just-turned-four year old wanted to be a policeman and have my 18 month old be “a criminal I can lock with hand cuffs.” We nixed that and the big one decided to be an astronaut while the little one will (hopefully) wear the hand-me-down giraffe outfit, assuming he stops being scared of it before the big day. Also, those owl cupcakes are ridiculously cute … and if you tie snakes into Phoebe’s hair please document it for all of us!!! I have a friend who dressed up as medusa years ago and I remember she just did her hair crazy (pulled it up messy and all of the place) and then stuck little plastic toy snakes out of her hair. My son is three and my daughter is 8 months. When I asked my son what he wanted to be for Halloween this year he said with great conviction, “Pancakes.” Since my daughter can’t voice her opinion this year, she is dressing as bacon and eggs. 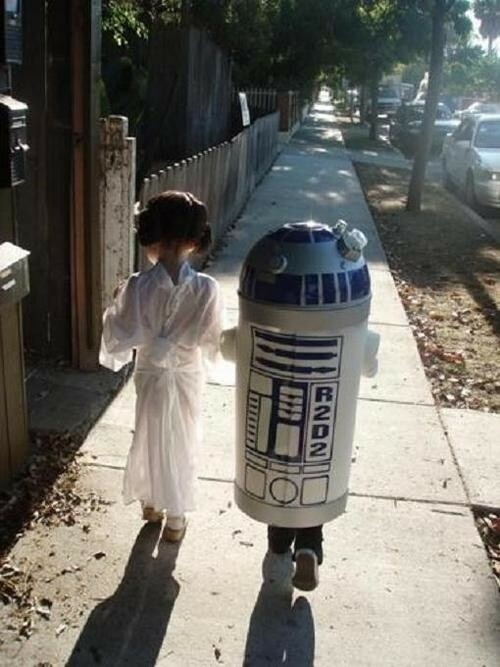 I am cherishing the few years when I can do the brother/sister themed costumes. I saw this Medusa headdress on pinterest the other day. http://www.halloweenforum.com/attachments/halloween-costume-ideas/7403d1255745233-medusa-headpiece-dsc00681.jpg I like that the snakes are gold. I’m pretty craft-challenged, so if I can do it, you surely can too. Good Luck! My college roommate would glue plastic snakes to a head band in a random, yet menacing, pattern. I also think hot gluing them to hair pins would be (difficult) but a great idea too. I think you’d need to be careful to avoid either gluing them shut accidentally or getting them stuck in hair. Good luck!! We always do a scary dinner sometime around halloween- mashed potato ghosts, mummy meatloaf, eyeball cupcakes, green gruel with eyeballs…. Guess I better put up some Halloween ideas pronto! Oooh — my kids are still a little too young to get Halloween (though I’m sure the eyeball cupcakes will get the one who’s old enough for solid food in the spirit), but I’m so digging the design ideas that I’ll practice on my coworkers (and take home the baking contest gold) this year, refine my techniques, and blow it out of the water next year. This is a post for the Barilla pasta Celebrate Pasta Day. My family and I will have our favorite Shrimp and Black olive pasta made with red sauce, a bit of cream, and crushed red pepper. I usually saute red onion and garlic, then do the shrimp, hit it with a little white wine, add the olives, reserved pasta water if necessary and toss it all with penne, or some similarly shaped pasta. Yum. Plate then top with shredded parm. Thanks! I absolutely LOVE the pumpkin treat baskets! But they are currently not available. I’ll try again for next year! 🙂 Thank you for the reco!